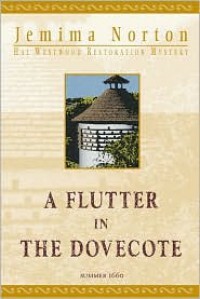 A Flutter in the Dovecote is an entertaining introduction to a mystery series set in what I've always thought was a surprisingly neglected historical period - the Restoration. The English Civil War is over and the monarchy has been restored in the person of Charles II, but neighbors who were on different sides, as well as members of the same family who have been physically separated by the conflict, are still unsure of each other. Hal Westwood, whose father supported the Royalists with the result that he has been mostly raised in France, has just married the daughter of a wealthy family that stood with Cromwell, and has brought her to his ancestral home. His uncle, who owns the property and intends to leave it to Hal, is missing, as is a tapestry that has been in the family for generations. The whereabouts of both are soon discovered, but this complicates the situation even more, as the crime is now not theft but murder. This is a promising start to the series but it still has quite a few weaknesses. I saw the solution fairly early on, and felt that it was pretty obvious. Also, I wasn't too sure how accurate the dialogue was, although the author did provide a glossary at the end and seems to have done a fair amount of research, However, most of the characters, with the exception of Hal's seductive French stepmother, who was a bit of a walking cliché, were well drawn and believable. I will definitely be checking out the other books in this series.